There is no ho-hum in sorghum. Home > Cattle > There is no ho-hum in sorghum. 04 May There is no ho-hum in sorghum. It’s been a while since we looked at the sorghum market, and its going gangbusters. A series of events have transpired to raise sorghum pricing levels for producers, although unfortunately for feed lotters this is raising their overall costs. In the 2017/18 season, northern NSW and Queensland were impacted by very poor growing conditions, this obviously led to an overall decline in yields. The NNSW and QLD regions are dominated by the domestic market, with the bulk of the countries cattle feed lotters, and a high number of pig farms, in the region. The drought has caused domestic buyers to pay up in order to compete against the export market resulting in ships of barley being sent from South Australia for feed purposes. In figure 1, the seasonality of sorghum on the Darling Downs is displayed. As we can see, the advance in sorghum pricing has been astronomic since September 2017. The current average price for April is $92/mt above average. At this point of the year, the seasonal pattern is for a decline in prices from Jan-Apr as the summer crop is taken into account. This season has been very much against the mold. It is worthwhile examining how this compares against the long term. In figure 2, the weekly price from 1997 to present is displayed. As we can see, the only years to achieve these current pricing levels were in 2002 and 2007. This coincided with major droughts, and also in 2007 the height of the commodities boom. There is no denying that these prices represent close to the best prices in twenty years. The next factor, which is yet to play out, is China. In the past fortnight China concluded their investigations into allegations of sorghum dumping by the US. This has resulted in a required deposit of 178.6% of the shipment value. This has made US sorghum imports into China unviable, and ships in transit have been diverted to alternate destinations. In figure 3, we can see the influence of China on the sorghum market. Prior to this decade, China barley rarely imported 1% of the global trade in sorghum. The past five years have seen them import on average 73% of the global trade! If demand for sorghum continues in China, and high deposits remain in place for the US, then sorghum producers have some interesting times ahead of them. The sorghum market is being assisted by the lingering effects of the 2017/18 drought in NNSW & QLD, high levels of stock on feed & political tensions between the US and China. Prices are currently at very high levels, but it remains to be seen how long they will continue their upward trajectory. The drought in 2017/18 is continuing to have an impact on prices of all cereals in NNSW/QLD. 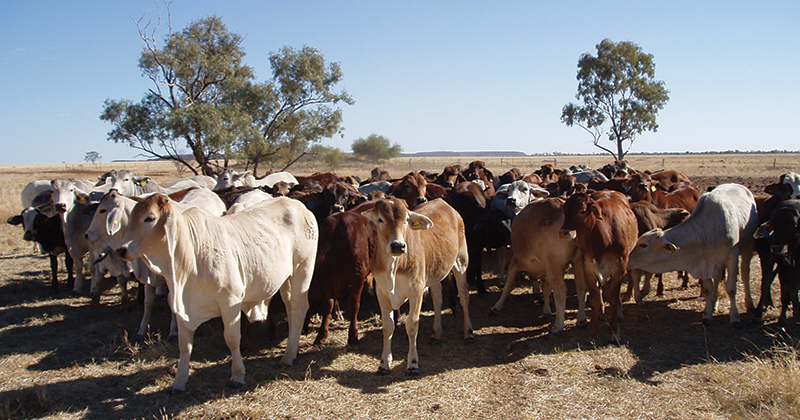 A high number of cattle on feed in QLD, continues to provide strong demand for cereals. Anti-dumping deposits by China are making US sorghum imports unviable.